Youth is certainly a state of mind in Manchester where the Hallé Orchestra is celebrating the 150th anniversary of its founding. Last night there was a celebratory concert presented by Dame Janet Baker (age 75) which included Ralph Vaughan William's Towards the Unknown Region and Edward Elgar's In the South (Alassio) as well as a 1996 Hallé comission, Thomas Adès' These Premises are Alarmed. Well done the Hallé for defying current music fashion and recognising that Elgar and Vaughan Williams did more than linger "lovingly over musical depictions of pastoral hills and fields, implicitly resisting the march of progress." Hans Richter, Sir John Barbirolli and Mark Elder are the conductors usually associated with the Hallé. 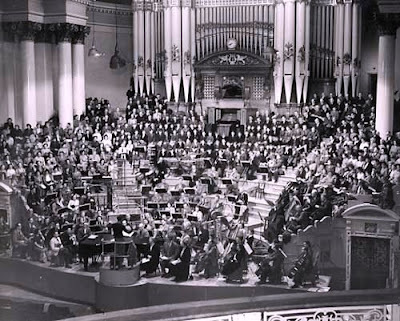 But my header photo shows Benjamin Britten rehearsing his Spring Symphony with them in Leeds in 1950. More on the Spring Symphony here.